For many, Halloween brings out some of our fondest memories. 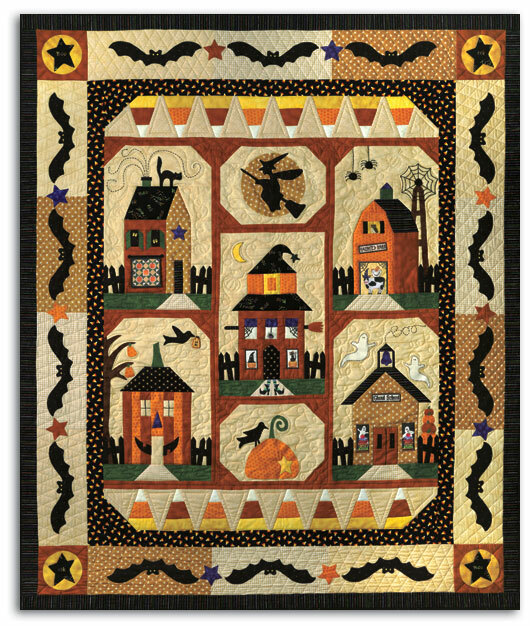 From flying witches, black cats, ghouling ghosts and trick-or-treating kids running from home to home, this quilt captures so many of those fun times ... and of course, don't forget the Candy Corn! Plus, that bat border is adorable, and gotta love that jack-o-lantern home! Completed Quilt measures 61" x 73" - (perfect to showcase in a favorite spot) features Maywood fabrics, and was desiged by Arlene and Melissa of The Quilt Company. And also the Specialty Button Pack (includes the jack-o-lantern pumpkin, the spider in the window, the owl in the barn and the swirly star on the tip of the witches hat). The Quilt requires 4 1/2 Yards of Backing (also NOT included), and can be purchased separately. Grab your Starter Pack before they are gone forever!